Rafa has arrived in Melbourne and had a short practice session today. Here are some headlines! Rafael Nadal is hoping illness won't hamper his tilt at the 'Rafa Slam' when the Australian Open begins next week. The world number one flew into Australia last night and he's confident the fever that hindered him during last week's Qatar Open won't be a problem. The Spaniard's quest for a fourth straight major title will begin with a practice session at Melbourne Park today. World No.1 Rafael Nadal began his Australian Open campaign with a rain-interrupted training session in Melbourne. The Spaniard, who has been battling the flu in the past week, hit for about half an hour at Margaret Court Arena. Slippery conditions forced Nadal to cut short his session before TV crews were allowed in for their scheduled 15 minute opportunity to film the left hander. Nadal is believed to have decided against having another hit later in the day under the closed roof at Rod Laver Arena. Rain foiled Rafael Nadal's Australian Open preparations today as the world No. 1 made an encouraging return to the court. Recovered from the illness which marred his semi-final performance in Doha, Nadal hit briefly in the drizzle at Margaret Court Arena before taking cover. 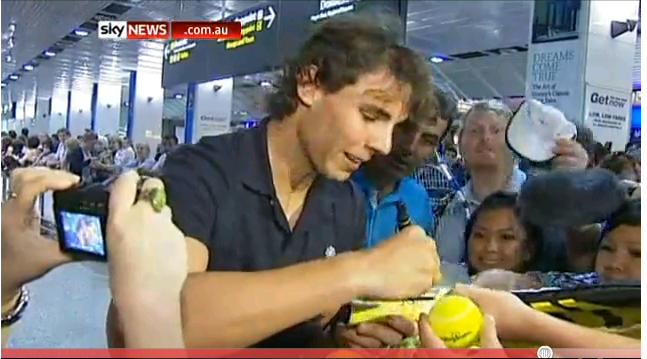 Rafael Nadal - Australian Open 2011 on Eurosport from Eurosport International on Vimeo.